Just when I thought I have seen all the brands that make pen displays and this comes in. 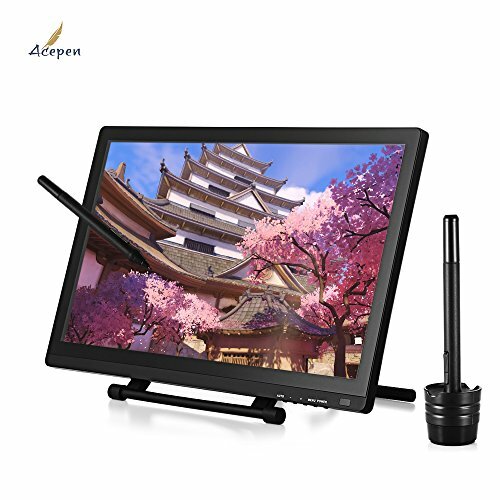 This is the Acepen AP 2150 pen display. It's basically a monitor you can draw on, a Wacom Cintiq alternative. Here's the thing about Acepen. I did a search online and could not find any company under that name, nor could I find the parent company that makes this product. Most places that sell this pen display list that it as having a one year warranty. My recommendation is to find out who's providing the warranty before getting one and where to get support when needed. The price for this pen display is really attractive. At the time of this review, it's priced at USD $369 on Gearbest. That's even lower than on Amazon and also lower compared to other competing models that look alike. I was actually very surprised at the pricing because this pen display works quite well. Please note the graphics cables included. If your computer has a miniDisplay port, you will need to buy an adaptor in order to use this display. The physical design of the AP 2150 looks very similar to many pen displays that I've reviewed before, namely Ugee 2150, XP Pen 22HD and Huion GT 220. The build quality is decent, design is functional. Overall, nothing too special or bad to shout about. The display can be positioned at different angles using the stand. Unfortunately, at the lowest angle, the monitor is actually resting on the cables beneath and this causes the monitor to wobble. The ideal angle to use would be low enough but with the 4 rubber feet still firmly in contact with the table top. The display comes with the following ports (from left to right), USB, Power, full-size, HDMI, DVI, VGA. Note that while a DVI port is included, a DVI cable is not. The USB port is for connecting to the computer so that the pen can be recognised. Depending on where you buy the display, it should come with the appropriate power plug, or at least on Gearbest it allows you to choose the power plug. I'm using the UK power plug, the one with three pins. The AP 2150 is a 21.5-inch display with a 1920 x 1080 resolution. This is an IPS panel so colour reproduction is quite good. I colour calibrated it with a Spyder5pro and it measured 98% sRGB and 77% AdobeRGB colour gamut support. Unlike other pen displays I've mentioned above, the AP 2150 actually ships with a matte screen protector already pasted on it. The matte screen protector provides a nice textured paper-like surface to draw on. The downside is the screen has a slightly hazy look because the sharpness is affected. This could be a deal breaker because it becomes difficult to check the sharpness of your images, such as when you're editing photos and videos. The alternative is to remove the screen protector but you'll have to draw on the glossy glass screen. So that's the compromise you have to work with to draw with the paper-like texture. Another thing about that screen protector is viewing angles are affected. If you view the display from any angle other than the front, the sharpness suffers again. Matte screens are usually never as sharp as glossy screens so it's not surprising. The thing is, I also have a matte screen protector on my iPad Pro and the sharpness isn't affected to the extent that I see on the AP 2150. The brightness of the screen is 250cdm2. I'm using it at 60% brightness so it's bright enough for me. The pen supports up to 2048 levels of pressure sensitivity. It has 5ms response time and 220pps tracking speed. Basically, it means there's little lag when drawing and strokes appear almost instantly beneath the pen tip. The pen is battery powered and the charging port is behind. The built-in battery capacity of 200mAh is rated to last for 220 hours, which is like 9 days if you draw non-stop. The two buttons on the pen can only be configured to basic click functions. One thing I don't like about the pen is actually the rubber grip which provides a good grip but it's prone to attracting dust. This is the pen stand that's included. The pen can be put vertically or horizontally on the stand. 8 replacement tips and the nib remover are hidden inside the pen stand that you can twist to open. There appears to be some hardware issue with my pen. When in hover mode, I can see the cursor moving around frantically. Sometimes when drawing, it will produce extremely jittery lines. This problem happens randomly and is difficult to reproduce, but it happens often. Since the Acepen AP 2150 looks exactly like the Ugee 2150, I tried using the Ugee pen and it actually works and had none of the problem. So I deduce that it could be a hardware problem with the Acepen stylus. Driver disc is provided. If you don't have a drive reader, you can also download the driver from AcePen's website. I've already uploaded the driver to my cloud storage online as a backup. In fact, a few days ago, I had someone asked if I had the driver for the AP 2150 because he had lost his disc. The driver is said to work on Windows XP / 7 / 8 / 10 and Mac. I'm using the display on a Mac and for the most part, it works well. I've also tested the pen display on Windows and everything works fine, including Adobe Illustrator where the pressure sensitivity works, unlike the Mac version. I tried installing the Ugee 2150 driver and it actually works. In fact, I think the Ugee driver is slightly better than the Acepen driver. I was able to tap on the screen to get dots easily. Before installing the driver on Windows, you need all the cables connected, e.g. graphics and USB cable. The driver does not have many settings. You can change the pressure sensitivity, customise the two side buttons and calibrate the screen to remove parallax. That's about all. Overall drawing performance is satisfactory. The matte screen protector is really nice to draw on, even though it affected the sharpness of the image quality. There's no lag whatsoever. After calibrating for parallax, accuracy is quite good. After choosing the pressure sensitivity that I prefer, I was able to draw really thin lines with the lightest of touch. The only main issue I had was when drawing lines quickly, e.g. hatching, sometimes the lines only start from the halfway mark. So for cross hatching, I just have to draw a bit slower. It's not a big deal. Here's my experience with the different apps that I've tried on my Mac. With Photoshop CS5, pressure sensitivity works well. Strokes taper nicely and are smooth without any angular jitter. The only one issue I faced is the inability to draw dots easily. You can't just tap on the screen and have the dots appear. You have to tap and drag slightly. If your art involves creating a lot of dots, do not get this display. The Ugee 2150 can create dots easily. Medibang Paint Pro works really well with this pen display. Pressure sensitivity does not work with Adobe Illustrator CS5. I tried installing Wacom Intuos driver because sometimes it can get the pressure working. But in this case, it made the problem worse and I wasn't even able draw anything any more. Pressure sensitivity works well with Mischief. I've reviewed many pen displays and I can't say that the Acepen AP 2150 stands out among the competition. But that's neither good nor bad. Overall, the drawing performance is quite satisfactory, comparable to other brands. The only main issue I had is with Adobe Illustrator CS5 where the pressure doesn't work. I'm not sure if Illustrator CC will have the same problem. One thing I like about the AP 2150 is it comes with a nice matte screen protector that feels really good to draw on. However, that same screen protector also affects the sharpness of the display. If you don't mind the display not being tact sharp, then this is a good pen display to consider. The only area of concern I have is with warranty support. Where would you get support from if there's something wrong with the display? Do you go back to the seller since there's no Acepen company to actually contact? I guess you do have to go back to the seller in this case. And lastly, I've to mention the insanely attractive pricing again. It's currently selling at USD $369 on Gearbest. That's below the USD $400 - $500 mark that pen displays of these sizes usually sell at. Even when you consider the shortcomings, it's still a very good and tempting deal. Thanks that seems to be the first real review of this cheap tablet. I am also considering it and I am also worried about the lack of company website. It seems that Gearbest cannot sell a lot from it even with this low price even the flash sale is on for weeks now. The biggest problem is the lack of driver updates. But it is great that you tried and the Ugee driver works (probably the two tablet is in fact really the same). Could you try this point problem with other drivers?? So you have a newer version of Illustrator??? CS5 is really old. Does the Ugee works in Illustrator??? Or the Acepen with the Ugee driver??? Waiting for a lot more info from you!!! I've just tried installing the Ugee driver on Windows and all the graphics app I used has pressure working well. E.g. Photoshop CS6, Illustrator CS6, Medibang Paint Pro. Pressure works with Illustrator on Windows. The problem with no pressure on Illustrator CS5 Mac is most likely related to that specific software. This is not the first time I encountered this problem. I've also have this problem with some other pen displays as well. Not sure if Acepen is from Ugee, but the physical design looks exactly the same. The pens and drivers are interchangeable. Thanks a lot for the kind reply!! You are really a great help. I am really considering it looking for the Gearbest page every day. They started to sell 80 units at the beginning of the week and now they are at 69 so they cannot sell a lot. The Ugee version is 500 which is clearly too much especially if these two tablets are really or almost the same. Or both just made by the same third party contractor (which is probably the case). They also sold the Ugee for this low price ($370) and they sold all within 2 days..soo people would need it and would buy it just the Acepen at least should have some kind of web page with a little promise that it will have a working driver for let's say the next version of mac os or windows. Could you solve that point problem you wrote??? That you have to move the pen a bit to make a point? And you wrote that it is better with the Ugee. Is this the same with all the softwares? Even the Acepen and Ugee driver windows and options look exactly the same. Thank you again for the great help!!! it seems to be one of a range of VERY similar products(maybe just rebranded). While trying to solve some issues with my Ugee 2150, I fell back to trying out other drivers. And to my surprise, when installing the drivers from XP-Pen (for the 22HD, and from the XP-Pen website), I noticed that the splash screen for the driver does even say "Gangzhou Ugee xyz..." - did you notice the same with the Acepen tablet? If so, you should be save using the driver from the Ugee-site instead. The Huion driver seems to be quite different, it was some time ago I tried that one, but I think I remember that with the Ugee tablet it only offered very basic and unreliable functionality(if at all). Thank you for your wide range of reviews! Yeah, many of them looks like they are rebranded. The design looks so similar. Without the brand, there's almost no way to tell them apart. Just got mine yesterday and I am very pleased so far with the drawing experience. One question though. Is it possible to attach two of those to one computer and use the same pen on both? With the good price it would not be a bad workset-up to have the secondary "full painting view" screen to also be pen supported. As we can almost certainly conclude that this is the same as UGEE 2150, drivers work, pen work, maybe you can do a test with this one and the UGEE if you still have both devices? The two displays should be able to detect the pen. I've tried a single Ugee pen across different compatible displays (but not connected to the same computer) and it works. Would you prefer the Acepen AP - 2150 or the Ugee ug - 1910B? They are really very similar in terms of functionality and performance. You can choose based on the screen size, or your table size. 1910B might appear sharper because it's a smaller screen with same resolution. Really is up to individual prefer.